FAQs » Disney Resorts » When will the Disney World gondolas (Disney Skyliner) be finished? Disney already has fantastic transportation options to help get you and your family around the entire Walt Disney World Resort area. But soon, in addition to the buses and boats and monorails and Minnie Vans guests will have a brand new transportation option to use: gondolas! Yep. That's right - gondolas are coming to Disney World, but just where will they go and when will they be available? Construction continues and if you're lucky, you just might get to see some testing of the Gondolas, too! The cars slow down significantly when they enter the station giving guests lots of time to load and unload. Once it exits the station, it picks back up speed and zips along at surprisingly quick pace! And it is all whisper quiet (and so fun to watch!). 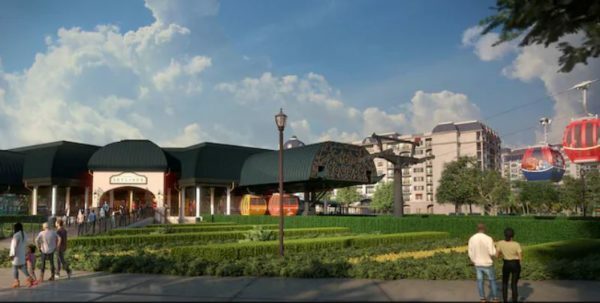 Disney released new concept art for the Skyliner station at the new Disney's Riviera Resort. 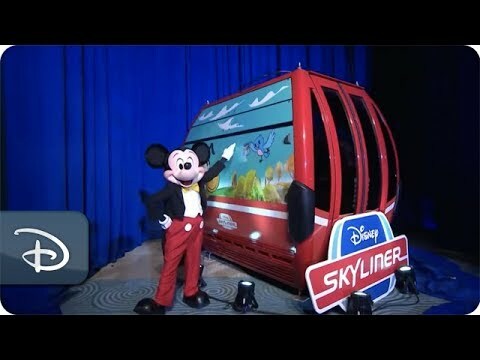 At Destination D, Disney Parks, Experiences and Consumer Products Chairman Bob Chapek proudly presented the crowd with a first look at one of the new Disney Skyliner Gondolas! Although we don't have an exact date yet, Disney announced on November 14, 2018 that the new Skyliner gondola system would begin operation in the Fall of 2019 - which should be in plenty of time ahead of the opening of Star Wars Land. Disney released a video today highlighting some of the key facts and information about the new system. Here are a few photos from September 2018. So much progress! Shannon looks tiny next to the giant pole! You can see the construction clearly from the Aruba section of Caribbean Beach. Construction is pretty far along over at the station in-between Art of Animation and Pop Century. This is taken from the walkway along the water on the Art of Animation side. I'm not ashamed to admit that I am over-the-top excited about this new transportation option. I'm also not embarrassed to admit that when I first heard the term "gondola" in my mind I was thinking of the small 2-3 person versions you'd see at most domestic ski resorts. It wasn't until Disney released the artwork that I fully understood the size and scope of this project - its major. And it is really cool. 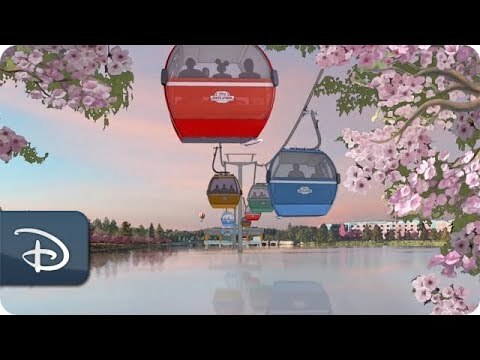 The new gondola system will be named the Disney Skyliner. 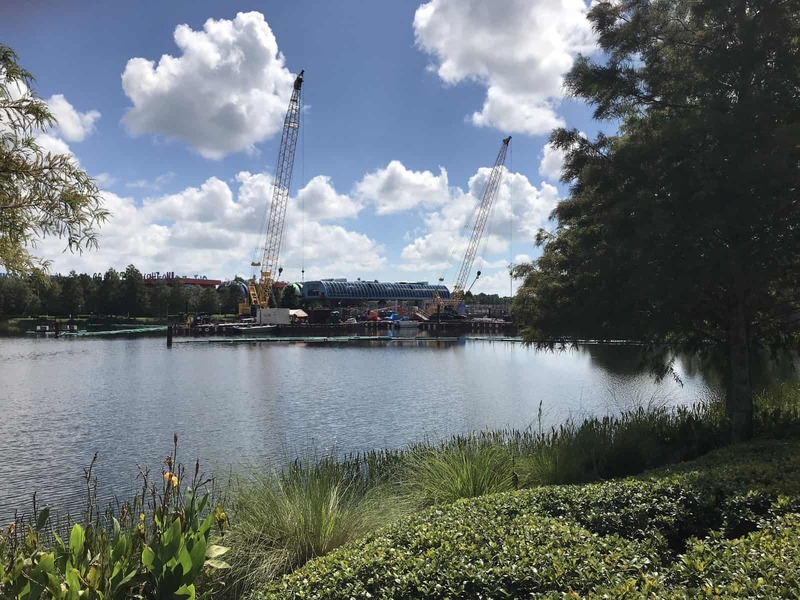 This new transportation system will link 3 resorts and 2 parks by carrying them high above the treetops for spectacular views of the entire Disney World Resort area. In true Disney fashion, these stations will be well themed and reflect the aesthetics of their location. The gondola cars themselves will also be themed and include artwork of favorite characters and attractions. Also, latest news reports are saying that the gondolas won't be air conditioned but will just have some ventilation holes, instead. Now, that isn't confirmed yet but some people are upset at the news. We're taking a more "wait and see" approach. I mean, I love the Tomorrowland Transit Authority PeopleMover but it doesn't have air conditioning, either. AND, I'd much rather sit in a moving "vehicle" where there are vents for air flow versus walking over the hot pavement of one of the parking lots (or standing still on one of the paths in Animal kingdom; that park always feels 10 degrees hotter than the others to me!). At the time of this writing, the gondola construction is well underway with towers popping up all over. But just when will the Disney Skyliner be open and ready to take passengers? The truth is - all we can do is guess. We still think it will be open in time for Star Wars: Galaxy's Edge (even with the newly announced August 29 opening) but whether or not it will be sooner than that, it is hard to tell. Since Disney has never installed a system like this before it is hard to gauge how far along they are and just what all still needs to be done. But, you can rest assured that as soon as we do have a firmer completion date, we will let you know! This is great, my family will enjoy this however it literally scare me and gives me anxiety. The thought of being stuck l one of these is just unthinkable to me. I’am thinking I’m not the only one who feels this way. So, I hope the bus system doesn’t change. That would be my first choice of transportation over the Skyliner. Will visitors be able to ride along if they aren’t staying at any of the resorts listed? We are planning an end of October 2019 trip and I am hoping this is up and running by then. However, we are only visiting Hollywood Studios and Magic Kingdom(not Epcot) and staying at a different location. The gondola will reportedly move at an average speed of 11 miles an hour (up to 15 mph should be possible, but unlikely) and it will supposedly carry about 4500 people per hour. That is the equivalent of almost 100 buses. With such large capacity, wait lines should be quite short, except at park opening and closing times, and after shows. Once onboard, travel time should be about 5 minutes from Riviera to Epcot, and about the same time on any leg of the trip. So, 5 minutes or so to Caribbean Beach, then exit and reload for HS or Pop Century and then another 5 or 6 minutes to them. I think the system will be fairly fast, but loading demand may affect it some. There will actually be 3 separate (though close by) stations at Caribbean Beach and anyone traveling on any line will need to disembark there, and then reload onto their new line. That is why Caribbean Beach will have the ‘Marketplace’ area and more restaurant choices. Think of Caribbean Beach as being the new ‘Moderate Resort Plus.’ The ‘Riviera Turn Station’ will allow people to load or unload, but will give people coming from the south, the option of just continuing on through to Epcot, and vice versa. The gondola will be a very big deal and will revolutionize travel between Epcot and Hollywood Studios, and between the resorts that are along it. One big problem with Disney World has always been the relative difficulty of going from one resort to another. The somewhat easier travel to other resorts has been one of the perks of the Monorail Resorts, and the Bay Lake/Seven Seas resorts in general, with their boat service. While Boardwalk, Beach Club, Yacht Club, and Swan and Dolphin are within walking distance of each other. Now Riviera, Caribbean Beach, Pop Century and Art of Animation will be ‘close’ to each other, and will all have excellent access to the restaurants in Hollywood Studios and in the back of Epcot. If this system works well, as I’m sure it will, then DO be expecting Disney to announce Extensions, to OKW/Typhoon Lagoon/Port Orleans/SSR and Disney Springs on one side, and another extension to Coronado Springs, Animal Kingdom, Animal Kingdom Lodges and the All-Star Resorts on the other side. I expect both of those extensions to be announced and complete within 5 years. 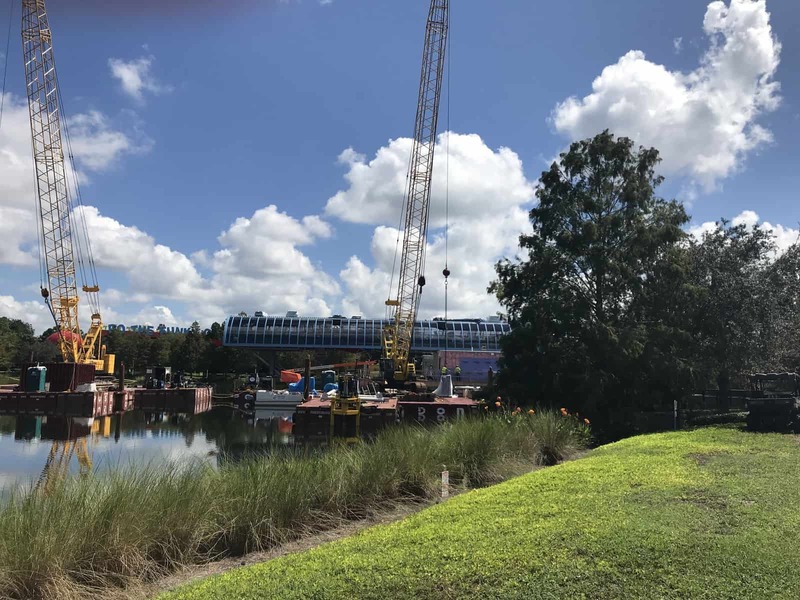 And that will only leave the final extension where the gondola system will expand to the 7 Seas Lagoon area, and the Magic Kingdom and all the resorts around there. Once the system is done, ALL the parks and ALL the resorts will be hooked together by Gondola. Travel time from Magic Kingdom to Pop Century, or Animal Kingdom Villas, or Disney Springs will be in the range of 30 minutes or less by gondola. At that point, I expect bus service to become much more limited. Since they are running the tests now, I am hoping that all goes well and we see a summer opening!!! I’m curious to see if Disney will charge visitors to have access to these… For example, having to pay a per diem fee for using them. Also, could non-resort visitors use them, or are they a perk for resort visitors only? I am okay with that, but it seems a little less than democratic. I’ve heard some people say that they think Disney will actually start charging for access to their BUSES, to make up for the Skyliner. Will Carribean Beach prices go up? That resort is usually one of the ones with the best rates during their, “Delicious Free Offer”. Probably won’t charge to use the Gondolas or the Buses, except for the slight increase in prices in general, to provide them. Any such moves would only encourage more people to bring their own cars, and Disney doesn’t like that. Part of it is the parking space needs and other problems that cars cause. But, Disney also likes their ‘Captive Vacationers,’ who don’t have a car, which makes it easy to hop in the car and go to off site restaurants, or even worse, drive over to Universal Studios. Of course, we have seen other bone headed decisions recently by Disney where they made the most money grubbing choices, even when it is likely to cost them more in the long run. When does fall begin and end in Florida ? Fall isn’t a Florida thing, it’s a hemisphere thing. In 2019, fall is September 23-December 21 in the northern hemisphere. Any idea how this will impact our trip April 2019 if we plan to stay at Caribbean? Shouldn’t have any impact at all. Most of the work on Caribbean Beach area has already been done, including the remodel as well as the new gondola. You will see a bit of construction work on the gondola, and almost certainly some major system tests, but that is about it. Actually, I’m staying January 2019 and it’s already under construction now. I’m excited about riding it. It will be so cool going over Epcot and Holly Studios. Caribbean Beach will be a much better resort with this additional transportation option. 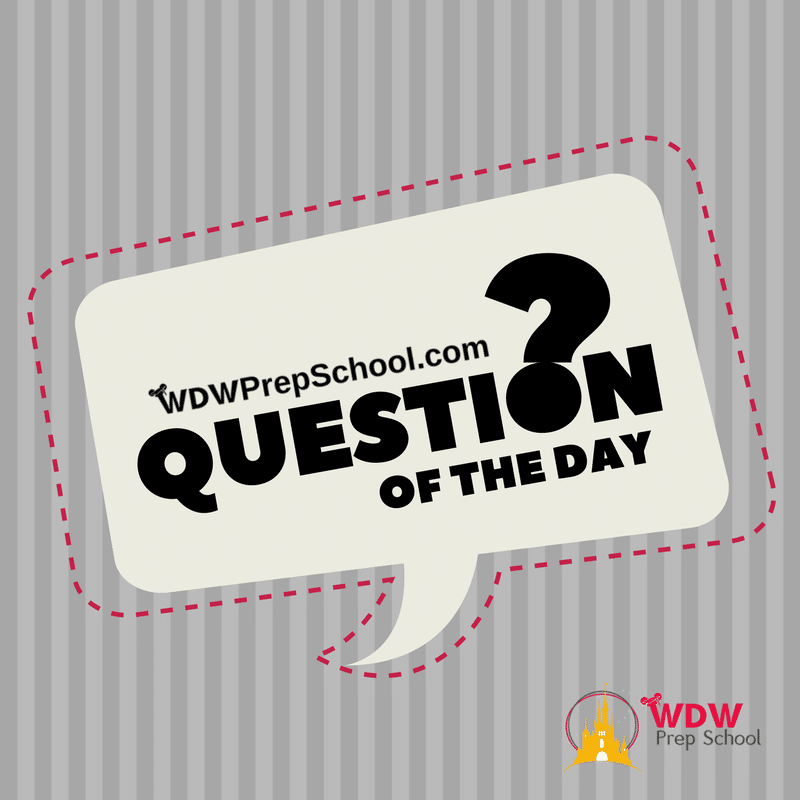 Have you heard any reliable estimates of how long the ride will be between destination points? I’m excited to ride the gondolas just for the experience! But I also wonder how they will compare in terms of convenience to other transportation options (which I guess is really just bus or car from those resorts). I’m guessing a ride on a gondola will only take 5-10 minutes if they move at around 5-10 mph. How long will be the line to board? Hmmm….? Actually, Disney use to have almost the same thing going over both Disneyland and Disneyworld. Yes, within a park they had that. This is being used as transportation to get between parks and resorts so it’s much larger. Can’t wait to try it.